Lots of kids will hurt their teeth, their gums, or their lips. Kids just do that sort of stuff. In fact by the time they get to primary school, a third of all kids will have had a dental injury ranging from mild through to severe. Injuries to the mouth and teeth will peak around the age of 3 to 4, and again around the age of 9 to 10. It won't surprise you to know that boys are a little bit more accident-prone than girls at all ages! A lot of these injuries are relatively minor, but sometimes, the more severe injuries can have lasting and often permanent effects on the teeth. There may be a lifelong treatment liability, with attendant costs that can mount to be very significant. Not only that, but the psychosocial effects are significant with children needing to have frequent periods of intensive, and sometimes invasive dental treatment, while carrying a self perception of disfigurement. Sometimes the long-term consequences of a dental injury are not immediately apparent. 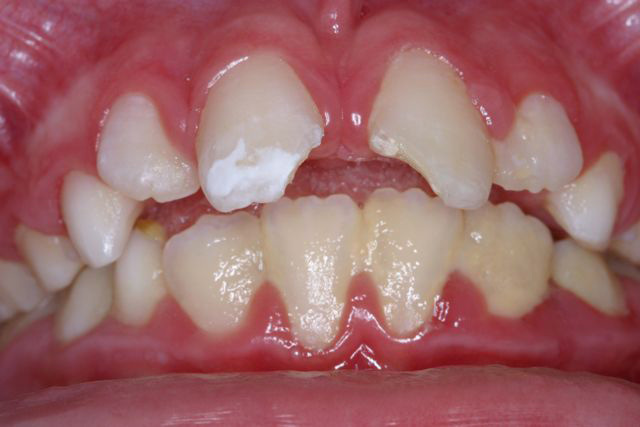 This is particularly so for injuries to the primary dentition where late complications may have unexpected effects on the growth of the adult teeth. In all cases it is wise to have your child's dental injury thoroughly assessed by your dentist or oral health professional. There is no doubt that emergency treatment is stressful for all concerned. Emergencies never come at a convenient time. Children are often upset, uncomfortable, and frightened about the prospect of visiting the dentist. Your dentist or oral health professional will be sympathetic to these special issues and will work with you and your child to try and make emergency management of their injury as gentle as possible. In many cases, an emergency phase of treatment will be required to stabilise the injuries and only after a period of natural healing can the final repair or reconstruction of the broken teeth be carried out. There are international guidelines on the best practice for managing dental injuries, and members of our organisation will be familiar with these guidelines. The emergency management is often the start of a long and sometimes difficult journey to deal with the effects of an injury. Your dentist or oral health professional will want to start by asking a lot of questions about the injury, about your child's health, and about their previous dental experiences. Only then will they start a thorough and comprehensive examination of the injury. It may be necessary to take x-ray pictures to look at the bone and deeper structures around the teeth. Other records and tests may also be needed. The broken bits of the teeth may need to be sealed up, and sometimes it may be possible to glue the broken pieces back together. Teeth that have been pushed out of line may need to be repositioned. Teeth that are loose may need to be stabilised with a fine piece of springy wire. If the gums are torn, they may need to be stitched back into place. Don't panic, your dentist or oral health professional is highly trained to deal with these problems. If an adult tooth is knocked clean out of your child's mouth, the best first aid is to put it right back into the hole it's just come from! The quicker the tooth gets back into the socket, the better the long-term outcome. Once that's done, try to get your dentist or oral health professional as soon as possible for a thorough assessment and stabilisation of the tooth. If the tooth won't go back in for any reason, it's important to keep the tooth's root from drying out. Gently wrap the tooth in plastic to prevent drying out, and fully immerse the tooth in plain milk if readily available. Once that's done, try to get to your dentist or oral health professional, or hospital emergency department, as soon as possible to see about getting that tooth replanted and stabilised. Once the tooth is back in, there will be a lot of things to do, but there will be time later to sit down and talk about the longer term plan. The prevention of traumatic injuries to the mouth and teeth is complex. Children should be carefully supervised to ensure that play equipment is safe, well maintained, and appropriate for the child's age and abilities. Approved child restraints and seat belts should be used while a child is in a moving vehicle. Children should be carefully supervised while playing with pets, especially dogs. Children should wear protective helmets when riding bicycles, scooters and other play equipment with wheels. An appropriately fitted mouthguard should be worn during sporting activities.